Dogs and cats – surely, natural enemies? Well, not always, but if you are a cat owner and you are planning to adopt a dog, then it’s worth thinking about what you can expect from your new dog, and from your cat or cats too. 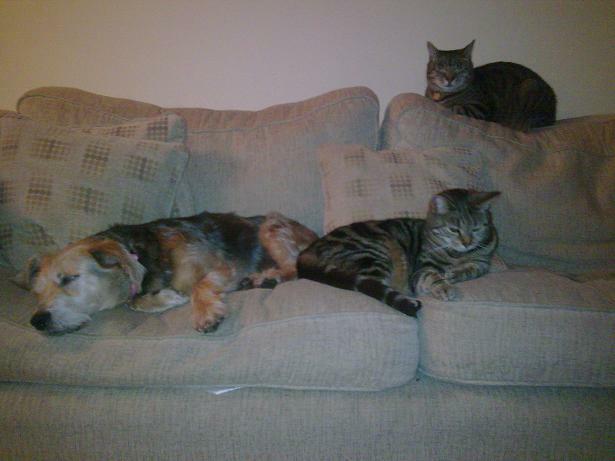 All the dogs that are marked with the ‘Good with Cats’ tag on the Oldies Club website are marked that way because they have either lived with cats before, or the rescue has told us that they have been assessed for their behaviour around cats. But introducing animals of different species is something that should always be done carefully, and it’s impossible to predict precisely how two individuals will interact when they first meet. Dogs don’t always behave in exactly the same way once they are in a home as they did in kennels. A dog that is too worried, insecure or distracted to think much about cats when he is in a kennels environment may well decide that a sneaky chase looks like fun once he’s arrived home and settled in. Or for some reason the dog may decide that some cats are all right, and other cats are chaseable. This dog gets on well with tabby and tortoiseshell cats, but likes to chase black or black and white ones. That’s the kind of thing that is hard for a rescue centre assessment to pick up. And let’s not forget the cats – cats are often animals with strong personalities, as most cat owners know. It’s not unusual for a cat to decide that teasing the dog is good fun. Cats can be clever too – there are definitely some cats that are quite capable of working out that provoking the dog into barking is a good way to get the people in the house to tell the dog off and pet the cat instead! – Introduce your pets with the dog on the lead. – if the dog tries to lunge at the cat or bark, distract him. If you can’t distract him, take him immediately out of the room and try again later. – Don’t allow the dog to wander around unsupervised until you are quite sure he will ignore the cat under all circumstances – even if the cat is playing, or running up the stairs. 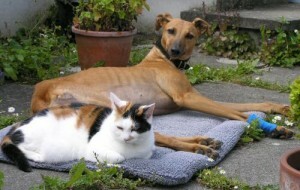 – Your dog may not realise that a cat outside is the same cat as he was inside and covered by the same rules. Carry out outdoor introductions on-lead as well as indoor ones. – don’t assume that because your dog is used to your cat or cats he will automatically be safe with all cats in all circumstances. Be careful around strange cats. – make sure the dog has plenty of exercise. Chasing is great fun for dogs, so give him plenty of chances to run about and chase balls or his dog friends, to exercise that need in a safe way. – Most dogs will want to chase a smaller animal that runs away from them. Don’t give him the chance to develop cat chasing into a habit. Distract, and reward the dog for looking away, all the time! Rewards could be treats, or perhaps the chance to play with a special toy, or have a ball thrown. – Dogs (unlike most cats!) often like to please their people. Show your dog how happy you are when he interacts nicely with your cat. Make it clear that the cat is one of your family. – Give the cat somewhere safe where he can sit out of the way and check the dog out until he feels confident. Somewhere high up where the dog cannot reach is often good. – If your cat is playful, get someone to pet the dog on the other side of the room, and try to get the cat playing with you with a cat toy. Playing is a very relaxing activity for cats and helps them accept new things. – Don’t let the cat sit in the way of the dog and not let him get by, steal food from the dog’s plate, or steal his bed. – Keep an eye out for accidentally-on-purpose teasing by the cat! – make sure the cat is not allowed to use the dog bed as a toilet. If this does happen, wash the dog bed thoroughly with biological washing liquid: the problem is likely to recur if the smell lingers, even if it’s only detectable to delicate cat and dog noses. If it happens again, replace the bed and put the new bed in a different place. – You may want to give the cat a dog-proof room to retire to, blocked off with a baby gate, for example. If you do this, try to encourage the cat not to retire to ‘his room’ and refuse to come out. You could, for example, allow him to sleep and play in his safe room, but feed him elsewhere in the house. – consider using a Feliway diffuser to help the cat feel more confident and relaxed in the presence of the dog. Confident relaxed cats are less likely to provoke inappropriate chasing. 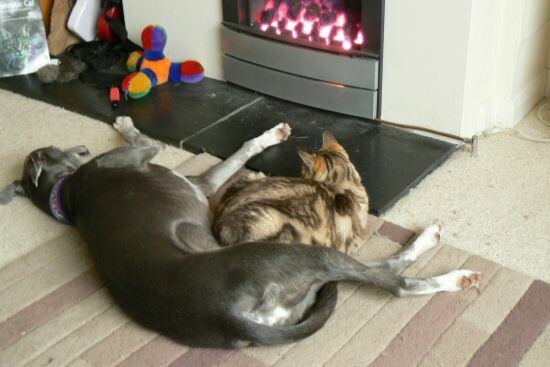 For inspiration, you might like to read Tess’s Rehoming Story : with a little persistence and lots of patience, Tess has learned to get along with a pair of quite nervous feline friends.